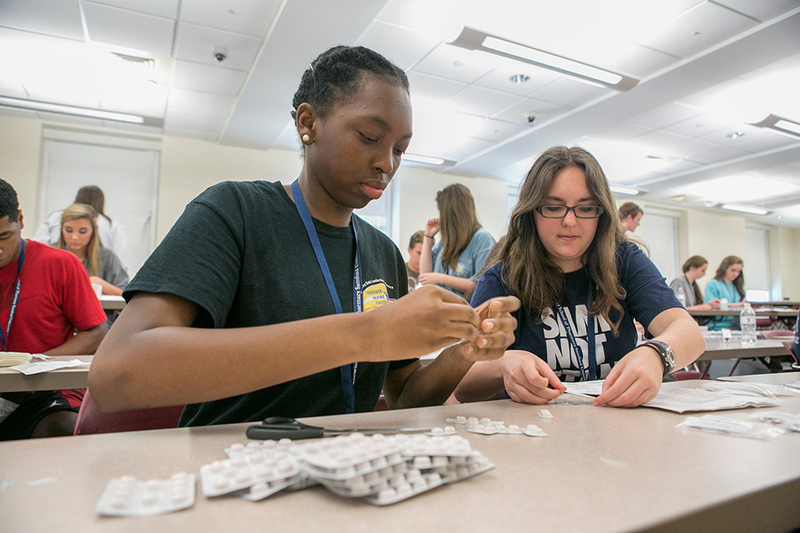 Forty-eight high school juniors, seniors and incoming college freshmen attended Samford University’s Pharmacy Bulldog Camp, a unique summer camp that provides an immersive experience into the world of pharmacy. Though the camp is in its fifth year, it took place for the first time in Samford’s College of Health Sciences, the new home of McWhorter School of Pharmacy. Attendees conducted labs in our new state-of-the-art facilities as well as traveled throughout the community to different pharmacy sites, giving them a realistic perspective of both the field of pharmacy and Samford’s distinctive Doctor of Pharmacy program. While no real medicine was involved, attendees compounded fake oral medicines, made creams and balms, and even learned how to make gummy bears (a camp favorite). Along with activities on campus, attendees participated in site visits to retail pharmacies, nuclear pharmacies, hospital pharmacies and others where they are able to visualize themselves in a variety of roles. Many of pharmacy sites they visited were associated with McWhorter School of Pharmacy alumni, and the camp was led by current students and faculty. At the conclusion of the camp, attendees had gained greater knowledge about the field of pharmacy as well as a refined vision for which area of pharmacy they might want to pursue. Many of those in attendance will begin their freshman year at Samford in the fall.